recommended for: Fans of Jeannine Garsee's The Unquiet, ghost movies, supernatural thrillers, and creepy boarding schools. Anyone looking for a quick, fun read for Halloween. I was really excited about this book, but it just fell a little short. It wasn't bad by any means. It was pretty entertaining and the concept was a fun horror-movie revamp. Some of the plot twists were even pretty clever. However, it just seemed loosely put together. There were pieces that didn't add up. Plots that added too much complexity where it didn't need to be. I also had a rough time really connecting with Dan. It felt like Roux was grasping for something like Looking for Alaska with the characters and fell a little short. Abby and Jordan have big subplots that don't get fleshed out enough, making me feel like they were just there to add drama. The main plot is pretty interesting, however. It toed the line between supernatural and real for a long time, which really ramped up the suspense. Not to mention, some of Roux's descriptions of the asylum were truly creepy. It's an entertaining read, but it just wasn't as tight and well-done as other supernatural ghost stories (try Jeannine Garsee's The Unquiet, which also deals with mental illness). This is a case of the overburdened subplots. The main plot itself was pretty good. People start to get murdered, the characters get creepy notes, and someone is messing with Dan's head. What's even cooler is that Roux sidesteps your average slasher movie or The Grudge type haunting and puts a lot of the action off-scene. So when Dan hears creepy voices and blacks out, we're left to wonder what was really going on while he was away. It's a great premise. What clogs it up is the extra baggage. Jordan telling his parents he's at gay reform school, Abby searching for a long-lost aunt who might have been in the asylum as a child. It's a lot to put in one story, and the Abby plot is especially far-fetched. You could include all these and do it well, but I just didn't think that Roux gave these plot lines enough attention to make them feel like more than extra material that should have been cut. In the end, they don't add much to the story. 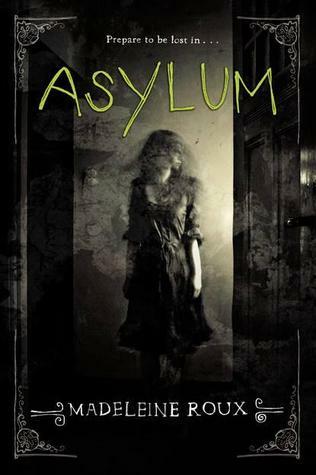 Mysteriously vanished serial killer, mad scientist doctor, criminally insane population, teenagers living in an old asylum--it's a great horror story set-up. Asylums are always creepy, especially the old kind, and it's even more interesting to have this building being the subject of controversy in a small town. The college wants to keep it, the townspeople think it's cursed. It has a lot of potential for conspiracy and intrigue. Roux did this pretty well, but I think she could have pumped up the history aspect even more. I couldn't get on board with Dan for a lot of the book. He struck me as kind of whiny and jealous. Right when we meet him, he's complaining about his roommate in what seems like a pretty entitled way. That gave me a sour taste. He does get better through the book and I started to sympathize with him over his emotional struggles. He just never feels fully developed. Plus, his mysterious background feels gimmicky. Then there are Abby and Jordan. They're both pretty flat, but they serve their purpose as sidekicks. I just wish we could have spent more time with them, especially since they're going through painful emotional struggles of their own. The writing style is what you'd expect of most young adult horror. Concise, clear, leading you along without attracting much notice to itself. Not as rich as it could have been, but decent. Except when you get to some of the descriptions of the asylum. There were chunks of description that were truly eerie, with unique metaphors and really tight, punchy phrasing. I'd have liked to see more of that kind of writing. The dialogue was a weak part, with all the characters sounding a little stilted. For the most part it was good and polished. What bugged me were the pictures. The real ones were amazing and added a ton of creepy-factor to the book. However, a bunch of them were computer-generated, which made it seem low-budget instead of creepy. A fast-paced supernatural horror that plays on your fear of the dark and the damned.